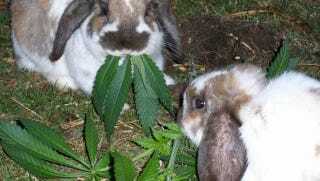 The photo you used in today's story about athletes eating their weed is a picture of two rabbits that my wife and I used to keep as pets. The picture is of them chewing on the vines (unfortunately not weed) in our front yard. I'm not mad or anything, just surprised and a little sad (the small one got sick and died this fall). Can I ask where you found it? In case you are curious (and you probably aren't) the big one is named Tonks and the little one is named Arthur.